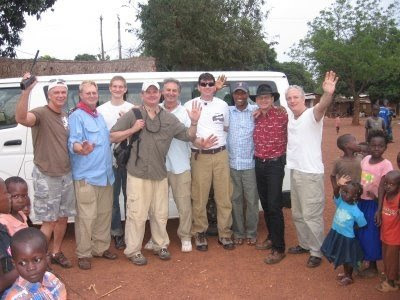 After two weeks and several hundred kilometers of rugged red dirt roads, the seven member team from the Hope Community Church, a Grace Brethren church in Raleigh, North Carolina, has returned home from the Central African Republic. The team included senior pastor Mike Lee, worship director Karl Moraski and newly appointed missions pastor Jean Eloi as well as four other men from the church. In this picture the team prepares for the night flight departure from the Central African Republic. The team spent days doing various work projects and visiting projects sponsored by the Raleigh church throughout Bangui, Berberati and the Bayanga forest. Hope church has adopted a region in southeastern CAR and is partnering with ICDI to empower community development activity, particularly in water and sanitation. Details of the trip may be read on the team blog at http://www.hopeforthecarnow.blogspot.com/.